Enriched with a full amino acid profile, VyoGain® is a balanced and optimal weight gain formula designed to support muscle growth, strength, performance and recovery when used in conjunction with a weight training programme. Maxi Carbs® powder is maltodextrin, a readily digestible carbohydrate produced from starch. It provides a sustained release of energy throughout intense exercise and promotes the storage of glycogen in muscle tissue. 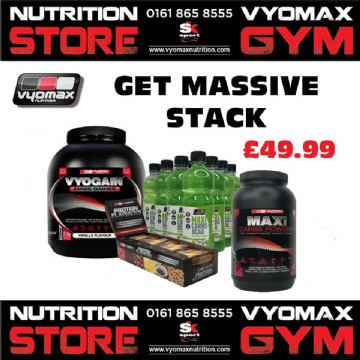 The Vyomax® Get Massive Stack - Get a Vyogain® 2.2kg, Maxi Carbs® Powder 1kg, Box of 12 Flapjacks and a case of 12 x 500ml Maxi Carbs® drinks. Vyomax® Creatine Monohydrate is a highly proven supplement which has been used for many years by athletes due to its performance enhancing effect. When taken as a supplement, Creatine can help to increase muscle size, strength, power and energy levels during intensive exercise. 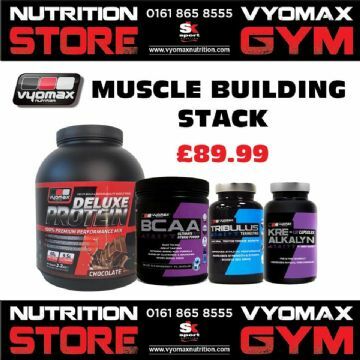 The Vyomax® Muscle Building Stack - Get a Vyomax® Deluxe 2.2kg, , BCAA Powder 435g, Kre-Alkalyn® 120 Caps and a Tribulus 100 caps.